Versatile, modern stoneware from Le Creuset. The perfect vessel for individual portions of French onion soup, baked mac and cheese, apple cobbler and more, this petite cocotte adds a touch of French charm to any table. The petite cocotte features Le Creuset’s industry-leading glazed interior, which protects against scratching, staining and odor absorption. Virtually nonporous stoneware delivers the superior workmanship found in every piece of Le Creuset cookware. Dimensions and Capacity: 8 fl. oz. ; 3.75" x 2"
Was very disappointed at the size of thee Petite Cocotte. It was a very small 8 ounces. The price for that was very expensive. In the future, will continue to purchase the larger size pots and grill pans offered by Le Creuset since I am very pleased with those items. We make individual chicken pot pies in these. They are amazing and the portion size is perfect! Gave them as Christmas present. The recipient was very happy to receive four of these beautiful and useful cocotte bakers/individual servers in lovely cobalt. We use it to store salt by our cooking area for that quick dash of seasoning as we cook. Since they match my Le Creuset pots, I had to give one a try as a salt cellar. Went back for 3 more to have on hand for soup or??? They hold less than a cup! They are way too small to be of much use, except perhaps to hold salt, but I bought 4 of them, so they are going back. I would rather pay the return postage than have them take up space in my cupboard because I simply will never find a use them; they are cute but not functional. And I had wanted them for so long too! What a shame they don't come in a slightly larger size so they could be used for a normal serving-size side or onion soup! Petite but just the right size! I like the size for individual portions for French Onion Soup, cobblers, and macaroni . I’ve been using it to hold ground pepper for easy access while cooking. Looks cute, works well. I love my small little Le Creueset's. Being a fan of Le Creuset, I got one of these and use it for a sugar bowl. It is the cutest! Well made and perfect size. Love these little guys. So convenient for all types of things. Beautiful and practical! these work great for making mini portions, pumpkin mini-pies, or even as soup bowls with lids. I enjoy using these colorful bakeware Petite Cocottes. I usually do not write reviews but this little gem deserves one. I keep my spices in this now. I have used this item in the stove because it can take the heat. Great item for the the price point! I guess I didn’t pay attention to the size of the garlic clove relative to the little pot. Someone suggested using it to store my little sugar substitute packs and that’s what I do. This is not at all what I thought I was buying. I'm an old bachelor who loves to cook. I use my new cobalt cocottes for my Himalayan Pink Salt and freshly ground pepper for seasoning... I love that they have the covers for all the obviously reasons. Plus I love how big they are as I have big hands and their size allows me easy access. They also match my Mexican spoon holder...! I bought this as a shower gift for my son's fiancée. Top quality Le Creuset . The bride was delighted. I just love my dear little petite cocotte, 8 oz, and in a lovely lavender shade known as "Provence". This will make the perfect serving size for single French onion soup, or any special dips. This so adorable I want it on the counter all the time. Made a mini casserole as a gift for a friend. I bought 4 ....3 are gifts! Now I want to keep them all! Also cannot wait to see the lavender one.... then I will post a picture! Love them, they are small enough to use for individual portions. Gave as a gift to my daughter and she was thrilled. She has some nice recipes that require a small casserole. She can now make them. I have a set of 12 now and use them quite often. They are incredibly handy to have around, and then when I make french onion soup, they pop right in oven to get the cheese on top nice golden and bubbly. Tons of uses! I purchased these to match 2 others I had previously purchased. These are much smaller than the previous version. VERY disappointed. I use mine as a salt well on my kitchen counter. It’s adorabke and goes well with my other blue Le Creuset items. It would also be great for individual servings of dishes like Mac and cheese or creme brûlée. Gave each of my daughters two of these for Christmas and will be ordering two more in the near future. Adds some class to a special recipe! Bought as a gift for my sister. She wanted them for French onion soup. Loves them!! I have not cooked in it yet but plan to soon. Very nice quality. Got these petite cocottes for Christmas breakfast. They are adorable and made the holiday table look special. These are a great size for a single fresh baked cookie then after it cooled off our paired deliciously with a scoop of ice cream on top. I put kosher salt in this. Reallyworks well for me because the top comes off easily while cooking and I do not have to stop and use two hands to open. Perfect serving vessel for a dish I'm planning to serve at a dinner party. 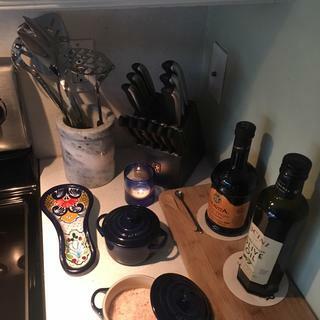 I have several Le Creuset pieces and really like the quality of their products. I purchased one a year ago, and I just love it! Daughter saw mine when served baked eggs in cream. She loved it, so I'm sending her a set for her birthday. I have 2 already. Seeing them on sale. Have wanted this for my kitchen stove for a long time, it was on sale now. I've loved Le Creuset for years. Now you make it in the color of my newly remodeled kitchen. Got to have it! They were beautiful and the price was right. The size I believe is perfect for some of my baked puddings, individual servings for onion soup, etc. Also the new color Sea Salt is gorgeous. If I did not already have a kitchen full of Le Creuset pans and lids I'd buy a complete set of Sea Salt! I'm going to use these cocottes as salt cellars. I am replacing a set that I ended up breaking. And this is a good price. Thanks! My son and his wife has this line. I like the idea in the description of using these for French Onion soup, so ordered 4 also for having guests over. I already have two of these and they come in handy for small amounts of leftovers. I use the petite cocotte to melt butter, warm maple syrup, heat up a single serving. It is perfect for small amounts of various foods. I have one already and wanted another one. I picked it because it came in the Sea Salt color and it matched my new dutch oven. A sales associate at the store mentioned it's great to keep butter during a dinner party to keep it from getting too soft. I'll most likely just use it as a dipping sauce container during parties. Uhh Duhh... they are SO cute! And, I have almost all of the Le Creuset stovetop/oven pieces..these are completing my set..for now! I've needed a small baking dish with a lid. I love the colors. My husband and eat differently. Giving these try. Want to make individual chicken pot pies and I liked the look of the Le Creuset dishes the best -- plus I love to add to my existing collection! It’s too cute not to buy! One of my set broke. How many are included in the package? BEST ANSWER: These are sold individually. BEST ANSWER: I gave these as Christmas gifts to my daughters so I do not know exactly, but they are small. Inside opening guestimate is about 2.5" tall by 4" wide. 2" H, 3-3/4"W - 8 fl. oz. - I hope this helps - they are great for individual servings or if you have more than one, dips etc for tacos and the like. These are individual dishes and the circumference of each is about 3.5 inches by 2" deep. They are also ceramic not metal. It is 3 3/4 inches across(inside dimension) and 1 3/4 inches deep. Will the honey color be available again? BEST ANSWER: Not any time in the near future. It has been discontinued. Would this work for French Onion soup? BEST ANSWER: I originally bought it for that purpose, but found that they were much too small for soup. I ended up returning for that reason. Yes, it would work for French onion soup. Just don’t over fill them. I also would put a pan underneath just in case which will also allow for them to be taken out of the oven easier. It would but it is a bit small. I use it to roast large elephant heads of garlic. It’s perfect. I think so. It is very small, though, But since it has a lid it is very nice. Kind of. That’s why I bought them but they’re pretty small. too small for french onion soup. better for dips. I have a French boule bread recipe that normally bakes in a 2-3 quart dutch oven that I'd like to try as individual portions, like bread rolls. Would these work for that? The oven is set as 450, so that is not my concern. Would bread (rolls) cook well in ceramic without the cast iron? BEST ANSWER: Hi, I am sorry but I cannot answer the question as I bought these as a gift for a friend and have not used them myself. It sounds like a great idea though and you might want to just give it a try! Best of luck! I bought these last year and use them often. I made a crème chicken recipe in bread dough and these cooked nicely. My dough was nearly a brioche. Can you put this petite cocotte under the broiler? BEST ANSWER: It is oven safe to 500°F, so as long as the broiler temperature does not exceed that, it will be fine. For storage, do these stack without the lids? Not securely, no; it doesn't seem like they were really designed to stack. But if you invert the lids they stack a little better. Not familiar with the product. Is it stovetop, microwave and oven safe? Is it easy to clean? BEST ANSWER: It's oven safe but not to be used on a cooktop that I know of.... I use it for small side items like scalloped potatoes, spinach soufflé etc... Very nice for a dinner party where each guest gets their own ramekin. Not for stovetop use -- it's made of stoneware. Microwave and oven -- yes. It's easy to clean but it's a good idea to use cooking spray to ensure food doesn't stick. Can this cocotte be preheated in the oven empty? I have never tried this, but I don't see why not, as long as you don't suddenly expose the cocotte to extreme temperatures; for example, after preheating them, submerging them in ice water. They are substantial for their size, made of thick ceramic material. Yes it can be heated empty. Are there recipes included with these coquettes? BEST ANSWER: No but I use mine all the time to make a small potato dish for 2, or bake and apple dessert...it's amazing. There is no recipe booklet included with this product.